Grape Seed (Vitis vinifera), one of the best high antioxidant herbs, contains a many health-giving active ingredients, such as protein, lipids, carbohydrates and polyphenols (which come mainly in the form of flavonoids, also known as procyanidolic oligomers (PCOs or procyanidins or bioflavonoids). It has been considered as one of the best anti aging herbs that boost immune system. Grape seed definitely belongs to the long list of foods high in antioxidants. The antioxidant power of polyphenols is 20 times more powerful than vitamin E, and 50 times greater than vitamin C. These antioxidant compounds have been shown to help protect against free radicals, the unstable molecules that damage cells and tissues throughout the body. Grape seed also exhibits anti-inflammatory, anti-allergic, anti-arthritic, and anti-microbial activity. Researches have shown that grape seed could be a potential natural cancer cure. Researchers are now linking free radicals to more than 100 diseases including cataracts, rheumatoid arthritis, heart disease, and cancer. Besides all the above disease prevention properties, procyanidins are thought to protect the body from premature ageing by increasing vitamin C levels in the cells and scavenging for toxins so the organs can get rid of them. The body produces some enzymes designed to fight free radicals, but our natural defenses can easily be overwhelmed by poor diet, stress, pollution, and other modern problems. Grape seed could be considered as one of the potential anti aging natural cures. Grape Seed's antioxidant / anti aging properties are featured in Natural Assets' AbsoGreens. Click here for additional information. Grape seed tones the capillaries and increase blood supply to the skin to reinforce the bonding structure of collagen, the substance that makes up blood vessels, skin, gums, bones, teeth, hair, and body tissues. The bonding promotes cell health and skin elasticity, making it more youthful. Procyanidins additionally help protect the body from sun damage, which can also cause premature wrinkles and premature ageing of the skin. 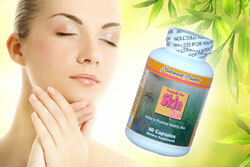 Grape Seed is featured in Natural Assets' Formula for Skin Plus. Click here for more information. Furthermore, grape seed extract has demonstrated an ability to improve a number of vision problems, including computer-related fatigue and sensitivity to glare. In another study, nearsighted patients taking grape seed extract experienced greater visual improvement than a placebo group. Grape seed, a best antioxidant fruit, has shown benefits in reducing capillary fragility caused by hypertension and diabetes. Grape seed's ability to protect cells and tissues from free radical damage is also helpful against heart disease. One study indicates that grape seed is more effective than vitamin C and E in protecting smokers against cell damage caused by tobacco-induced free radicals. One other of the grape's beneficial & active property is called resveratrol. This chemical is found primarily in the skin and seeds and includes all those above mentioned characteristics, but it also has neuroprotective capabilities to help the brain and its processes work efficiently. Resveratrol has also demonstrated an ability to lower cholesterol and triglyceride levels and provide antioxidant protection; some studies have shown that resveratrol may even help slow tumor growth. Grape Seed is featured in Natural Assets' CholestMin. Click here for more information.